Was Joe McCarthy a bellicose, shameless witch-hunter who whipped up hysteria, ruined the reputation of innocents, and unleashed a destructive carnival of smears and guilt-by-association accusations? Were McCarthy and McCarthyism the worst things to happen to American politics in the postwar era? Or was McCarthy just a well-intentioned politician who seized a legitimate issue with the fervor of a true believer? Perhaps something in between. For the first time, here is a biography of Joe McCarthy that cuts through the cliches and misconceptions surrounding this central figure of the 'red scare' of the fifties, and reexamines his life and legacy in the light of newly declassified archival sources from the FBI, the National Security Agency, the U.S. Congress, the Pentagon, and the former Soviet Union. After more than four decades, here is the untold story of America's most hated political figure, shorn of the rhetoric and stereotypes of the past. Joseph McCarthy explains how this farm boy from Wisconsin sprang up from a newly confident postwar America, and how he embodied the hopes and anxieties of a generation caught in the toils of the Cold War. It shows how McCarthy used the explosive issue of Communist spying in the thirties and forties to challenge the Washington political establishment and catapult himself into the headlines. Above all, it gives us a picture of the red scare far different from and more accurate than the one typically portrayed in the news media and the movies. We now know that the Communist spying McCarthy fought against was amazingly extensive -- reaching to the highest levels of the White House and the top-secret Manhattan Project. Herman has the facts to show in detail which of McCarthy's famous anti-Communist investigations were on target (such as the notorious cases of Owen Lattimore and Irving Peress, the Army's 'pink dentist') and which were not (including the case that led to McCarthy's final break with Whittaker Chambers). When McCarthy accused two American employees of the United Nations of being Communists, he was widely criticized -- but he was right. When McCarthy called Owen Lattimore 'Moscow's top spy,' he was again assailed -- but we now know Lattimore was a witting aid to Soviet espionage networks. McCarthy often overreached himself. 'But McCarthy was often right.' 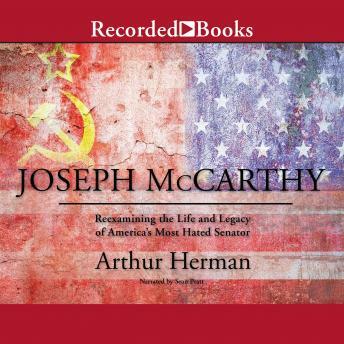 In Joseph McCarthy, Arthur Herman reveals the human drama of a fascinating, troubled, and self-destructive man who was often more right than wrong, and yet in the end did more harm than good.